Good day to you and welcome to the first Blog Hop for 2015 - TAMMY FOR ALL SEASONS. I'm so excited to be here and glad you are too. 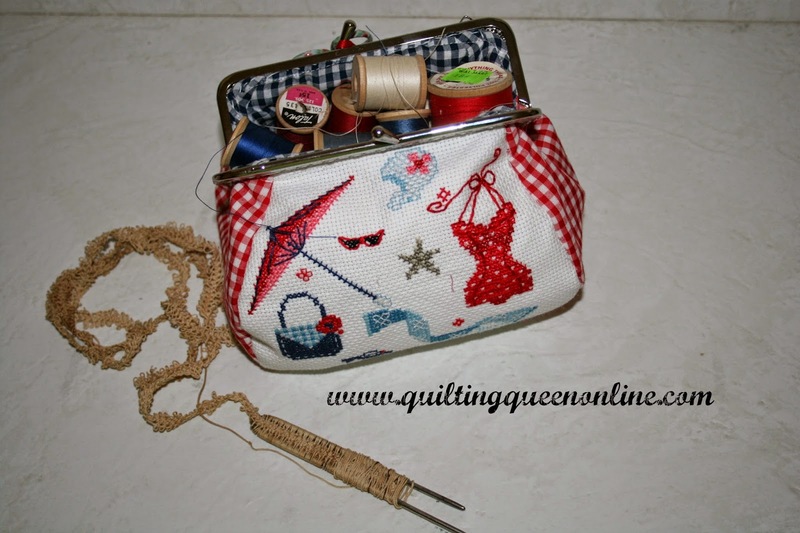 I've been seeing all these neat TAMMY Bags on all the blog hops for over a year now. I really liked them but I'm not one to make too many bags. I ordered the pattern a long time ago.... yep, never made it. Then Mdm Samm at Sew We Quilt came up with the TAMMY FOR ALL SEASONS blog hop and that was my motivation to get started. Sew We Quilt teamed up with Brooke Nolan and Cory Blunt to create some vintage counted cross stitch and pinny's for our bags in each of the four seasons. Guess what season I picked... YES, I picked SUMMER. First it's my favorite season. Second Brooke's design was red/white/blue. And third, I figured by the time mid January rolled around, we'd need something "summery" to remind us of fun, warm days ahead in the midst of the cold, dreary winter weather we're having. So without further delay.... 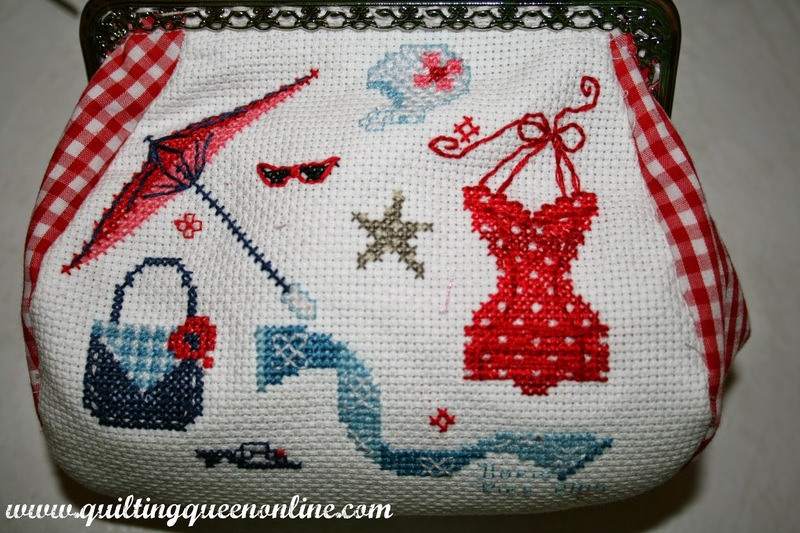 Here's my TAMMY FOR ALL SEASONS VINTAGE SUMMER BAG. The cross stitching up close. I added some outline stitches to give it more definition against the white Aida cloth. And my Pinny on the back. I ordered Cori's pattern, which is super cute but I had other visions for my Pinny. I thought what is more vintage and summer and red/white/blue than a bunting? So here's my bunting on my Pinny. And the back of my Pinny to hold my needles, scissors, and the cutest little pocket to catch all my threads. I couldn't resist a few more pictures of my Tammy bag. I had fun taking them. It looks so cute on my vintage red bicycle. Now hop on over to the others on the hop and see what creativity they did with their TAMMY FOR ALL SEASONS BAG. You're gonna love them all. How clever your bunting is! Pretty and clever. Love your Tammy bag - always be summer using it! 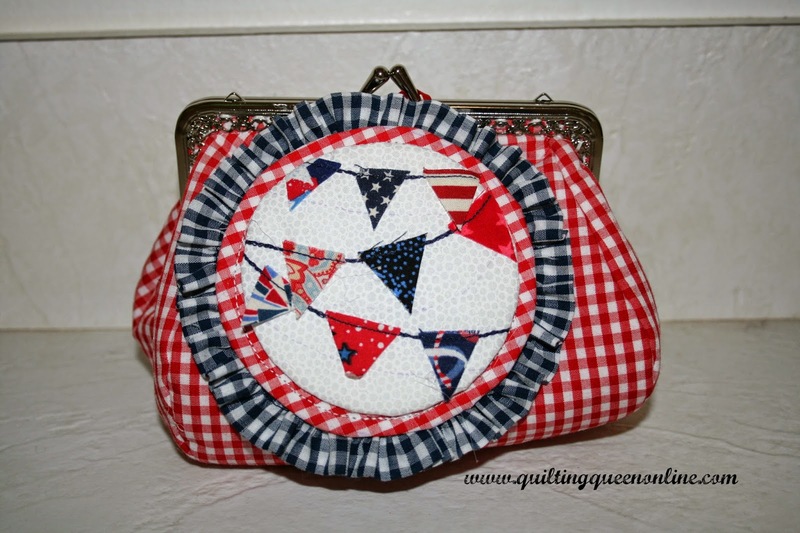 Your Tammy Bag is so adorable, and the Pinny in red, white and blue matches perfectly! Wonderful and lovely. Your Tammy is adorable and the bunting on the Pinny is such a good idea to the summer Tammy. Doris, you did good. Love seeing the gingham for your Tammy Bag. Love it, and your pinny is adorable. Thank you for being part of this great hop. The gingham on the Tammy is just adorable. Love the picture on the red bicycle seat. "Sew" nice and summery. The bunting went very well with your sweet bag. I have a feeling we will be seeing more summer soon. I love summer too, and your pictures are so fun. Your Tammy is beautiful! Love how you added your own twist to the Pinny. Thank you for sharing. The Tammy bag looks absolutely stunning! Gorgeous. The bunting on the pinny is a great find! Well done you. What a wonderful fabric choice with this red Gingham fabric! Fits so perfectly for the summer pattern, I should do another summer tammy as well, I love your Version! Looks great. The gingham is perfect for the vintage look. The outline stitches were a really good idea, and I love the gingham! Also, your bunting pinny is very clever. Awesome job! I like your bunting pinny! What a great idea! I also like your red gingham, it really is a good accent for your wonderful stitching. Your Tammy and Pinny are gorgeous all done up in blue and red gingham! Red, white and blue - lovely! Love the bunting on your pinny. Oh so sweet..I love your colors!! Awesome work my friend ! I like that you changed the pinny up to make it your own. And your photography is VERY good ! I love the bag on the bike too ! I love your summer Tammy with the red gingham fabric. Your pictures are just wonderful as is the sweet bunting pinny. I love it. Especially the red white and blue colors. Makes me long for warmer weather! Your take on the pinny is so cute! It goes really well with the Tammy bag! Very cute! I see we had similar ideas about the colors for the same Tammy Bag - and we're sharing the same "blog hop" day! :-) Your Pinny is precious! Love it!!! Loved seeing your bag sitting on the vintage bike - perfect - even the color! I do think the added outline stitching was the way to go. Cute, cute pinny. Your Tammy bag looks perfect with that gingham and sitting on the bike. Cute, cute pinny! Just love your summer set. Turned out gorgeous and your pictures are so cute too. Love your red bike. Your Tammy and pinny are simply delightful. They look so fresh and bright. A great duo for summer, or when you want to invoke summer. Lovely work! BUT YOUR BAG AND PINNY are a SUCCESS!!! and I sure did love the layout of your photos...such cute background items!!!! Lovely photos of your Tammy and pinny. Great job and thanks for sharing!! 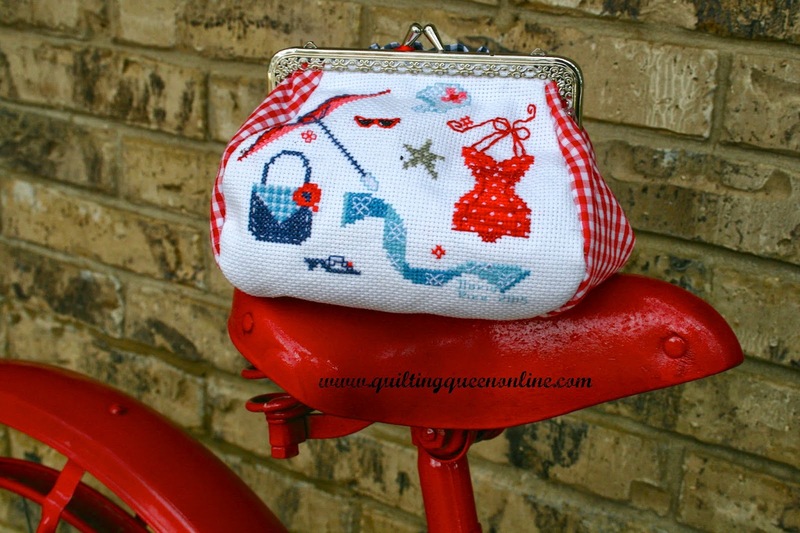 Seeing your pretty red gingham cross-stitched bag on your red bicycle made me smile. What a lovely job for your first Tammy bag. I love the little flags you added to your pinny, too. Beautiful work! Beautiful bag and pinny. So happy to see those summer colors with the grey winter we have been having. Doris~ Thanks for the fun, inspirational post. 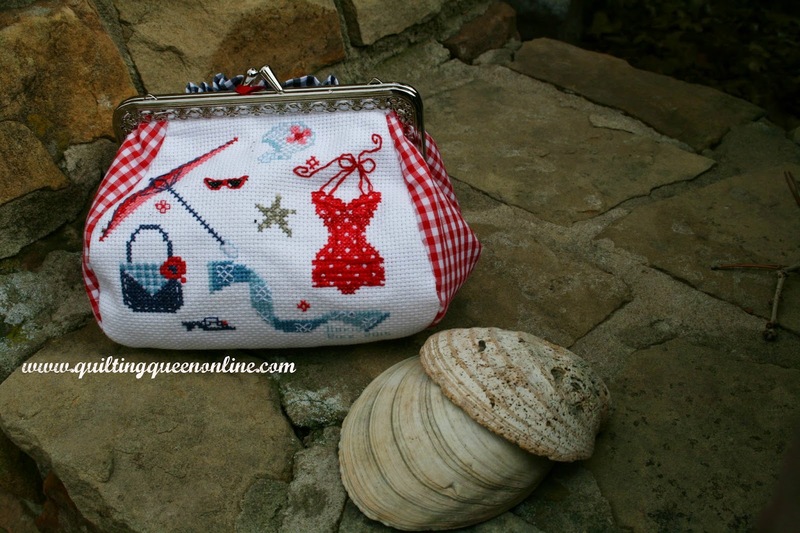 I love the red gingham with white Aida and the summery Tammy bag with this cold weather we are having in OK. We may be back in the 60's next week. We'll think it's swimming weather - lol. Your bunting is very creative and so adorable - makes me think of our summer holidays. Thanks for sharing your wonderful, creative work and being a great inspiration. I love the red, white and blue color combination. The Tammy Bag and Pinny are very cute. 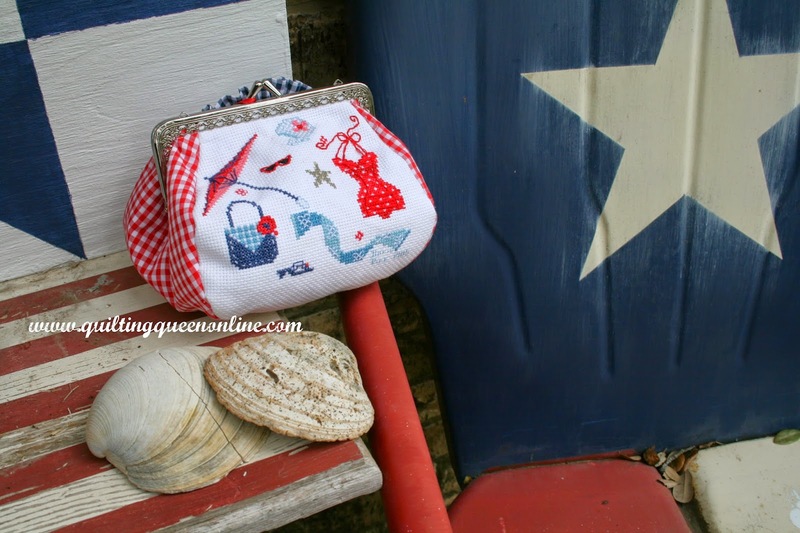 Love your Tammy bag, and the Pinny design is the perfect compliment for your seashore theme. Great colors for summer! 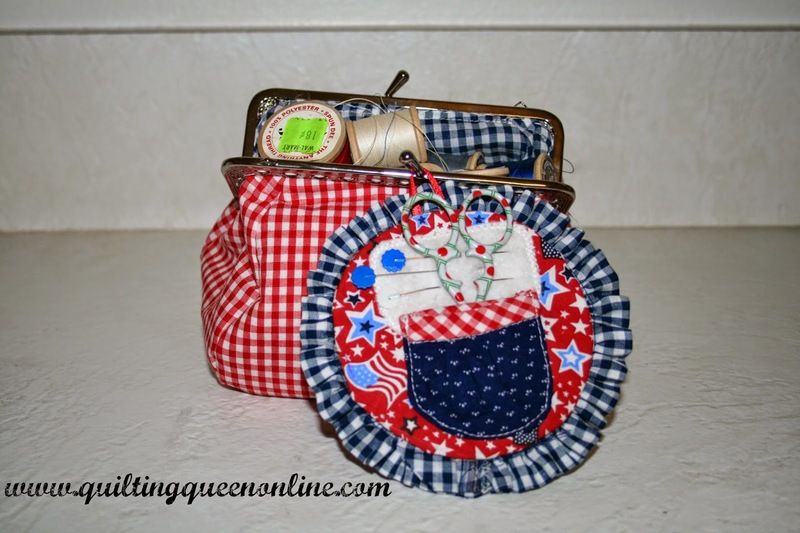 Thanks for sharing your patriotic Tammy and Pinny with us it is beautiful. Love the little bunting on the pinky,too cute! Love your summer Tammy and your banner is stellar. Great work, Doris. Your pictures are so fun and really showcase the essence of summer. Love your pinny. That is amazing! Such delightful cross stitch! Oh so pretty, I love those fabrics. And your Penny sure compliments it! They both turned out just adorable. Nicely done. Very pretty. 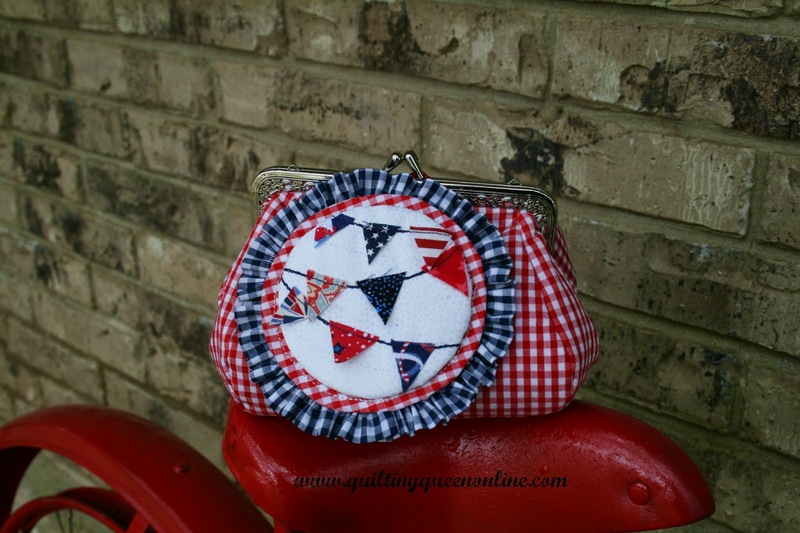 Love the red gingham, and the red white and blue bunting on the pinnie is lovely. Hey, Doris - Your Tammy Bag is great and that little bunting on the Pinny is just perfect. 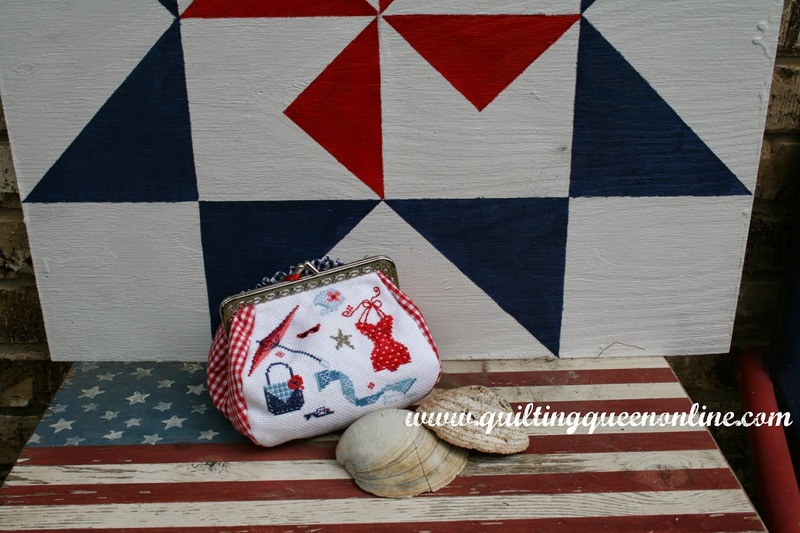 I especially love the photo settings with the shells and your fun patriotic quilts. Well done!